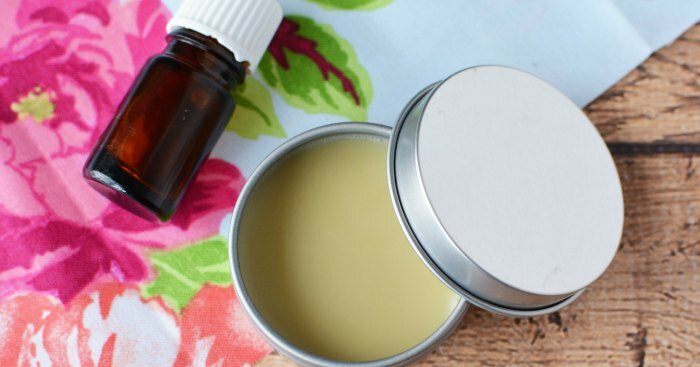 This Homemade Lip Balm will be a hit with your entire family! Looking for a way an easy and natural way to moisturize your lips? This All Natural Cocoa Butter lip balm is simple to make and will have your lips moisturized in a matter of seconds. I don’t know about ya’ll but it’s so hard to find all natural lip balm that doesn’t cost a fortune. This recipe is so frugal to make and works incredibly well. 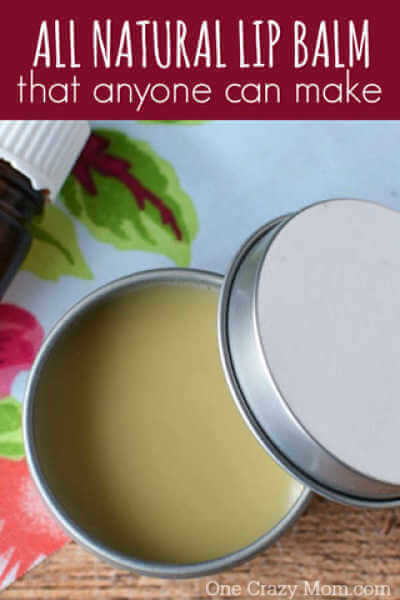 This all natural lip balm is moisturizing, easy to make and very inexpensive! What more could you want? I think you will love this and I can’t wait to hear what you think! If you are trying to convert to natural products, this Cocoa Butter Lip Balm is wonderful! 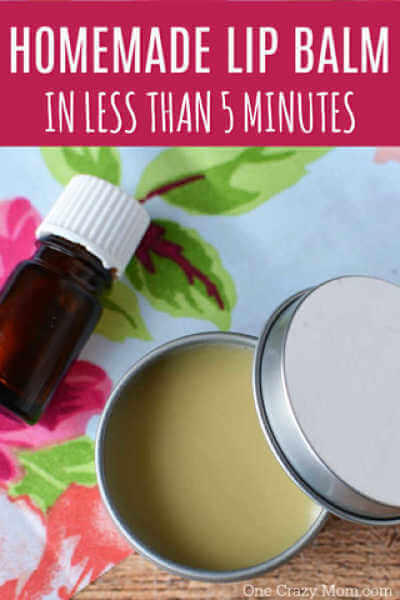 This all natural lip balm will not bust your budget or take hours to make. It is very simple make. 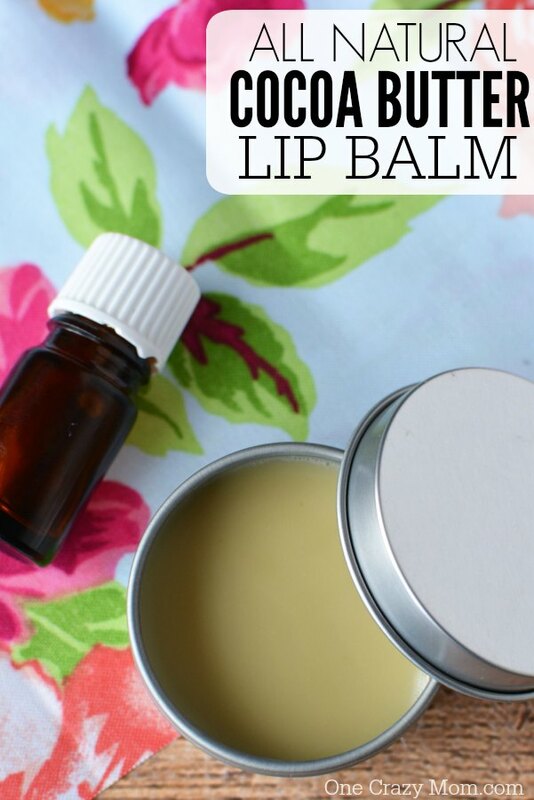 If you worry about all the yucky chemicals in store bought lip balm, give Natural Lip Balm recipe a try. I love knowing that I am giving my family all natural products to use. No worries about chemicals and works I can’t pronounce. 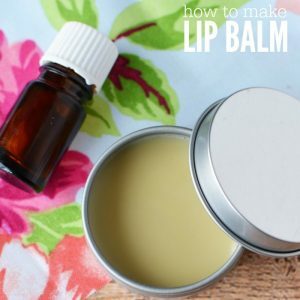 How do you make natural lip balm? This recipe is very simple, all natural and simple. You can feel good about what you are putting on your lips. We love using all natural products that are chemical free! I don’t wonder what I’m putting on my skin or my children’s skin. You can feel good about giving this to your kids to use. What can I store Homemade Lip Balm in? We are always making something around here so I order a big box of containers on Amazon. It is so handy having these already here when I am making a new product. They are very inexpensive and it tends to be a better deal by purchasing several at one time. You can see several containers on sale here. I love the tins but sometimes I also get these purple frosted containers. They are so pretty! If you prefer clear, there is a nice set here. You can also use a tray that is super easy to just pour your lip balm into. You might prefer lip balm tubes and those can also be purchased on Amazon. You can also try making Homemade Lip Balm with Coconut Oil. This makes a great gift for friends. Sometimes I even make extra batches to hand out to friends and family. They make really useful and cute gifts! You might consider putting together a gift basket with lots of natural products including this fabulous honey lip balm recipe. Let’s get started making this Cocoa Butter Lip Balm! You will love his easy this Shea Butter Lip Balm recipe is. It is so moisturizing and easy to make. It’s the perfect remedy for dry winter skin. 1. 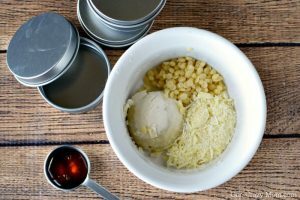 In a small microwave safe bowl, add beeswax, cocoa butter, and shea butter. Microwave for about 2 minutes, stirring every 30 seconds. The beeswax will be the last thing to melt. Just keep stirring, it will melt! 2. When melted, stir in honey and oils. 3. Quickly pour into a small container and let set until hardened. So simple! Now you know how to make lip balm! I think you are going to love the results and the whole family will enjoy it. You could also experiment with other essential oils such as peppermint essential oil. Peppermint lip balm would be fabulous around the holidays as a gift. How do you make lip balm with coconut oil? here is a great recipe here for Homemade Lip Balm with Coconut Oil. 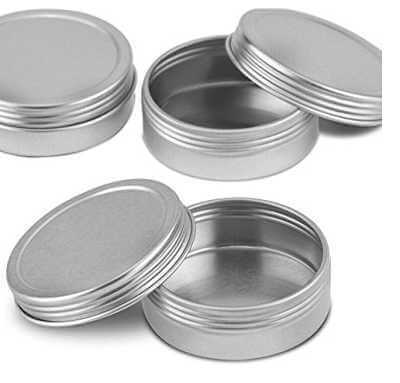 This is a nice alternative if you want to try making more lip balm. You can also try making Cocoa Butter Lip Balm recipe without beeswax if you prefer. Some people prefer to use a double boiler instead of the microwave. Is coconut oil good for lips? Yes! It is very moisturizing and effective at relieving dry skin. 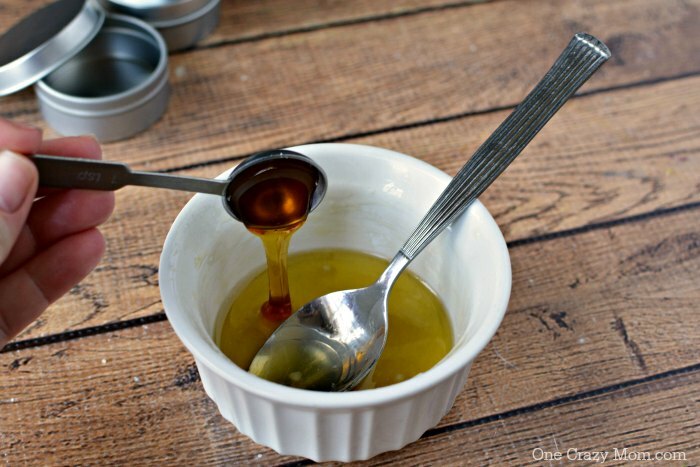 Almond oil and olive oil also work great as natural ingredients in homemade lip balm. Is cocoa butter good for lips? This is also another moisturizing ingredient perfect to get rid of dry skin. We also love Chocolate Lip balm recipe for a fun twist on the traditional lip balm recipe. Apply liberally to lips as needed. Easy! Don’t forget about your friends! Homemade lip balm makes a great gift! Looking for more way to moisturize your chapped lips? 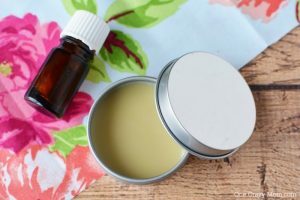 This Homemade Lip Balm recipe is so easy to make and will have your lips moisturized in a matter of seconds. 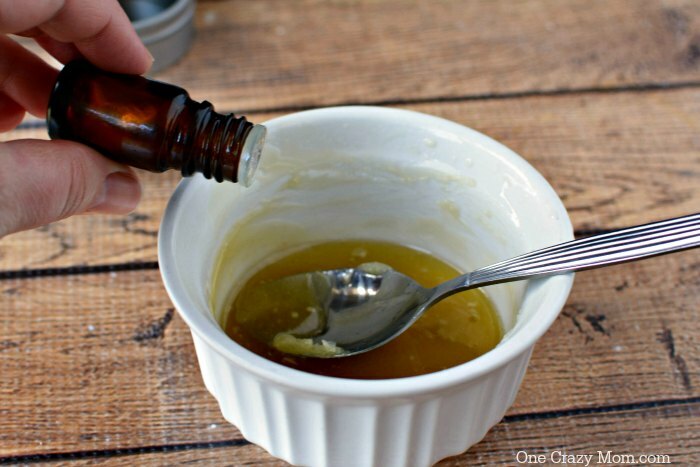 I even use this diy lip balm to provide natural color as a lip gloss. Just a small amount of this lip balm recipe will do the trick. We love making natural products and this Homemade lip balm recipe does not disappoint. Get started making natural products today! You are going to love having so many natural products to grab in your cabinet! The entire family will benefit from these products. Your budget will also benefit as well! You can also learn how to make lotion with this simple DIY recipe. No worries about what all you are putting on your skin with this all natural homemade lotion. It feels so good to have these products on hand to give your family. You will love making your own natural products to use. I love learning new ways to give my family natural products. It saves money and keeps all the chemicals and less desirable ingredients out of our house. A win for us all for sure! You will love these other natural ideas to try. Forget paying way to much for dandruff shampoo at the store when you can make The Best All Natural Dandruff Shampoo Recipe at home.